Well, we might not be sure what to call it, whether it’s a holiday installment or what’s going on with those outfits from the first promo photo – but it’s official: Filming on the highly anticipated one-off episode of Sherlock kicked off today. It seems fitting that filing on a new Sherlock episode begins on what is generally accepted to be the birth date of the fictional sleuth himself (January 6). But we still generally have no idea what this one-off is going to be about. Don’t think too hard about how in the world Moriarty is going to mix in with the Victorian outfits, though. You’ll just get a headache. 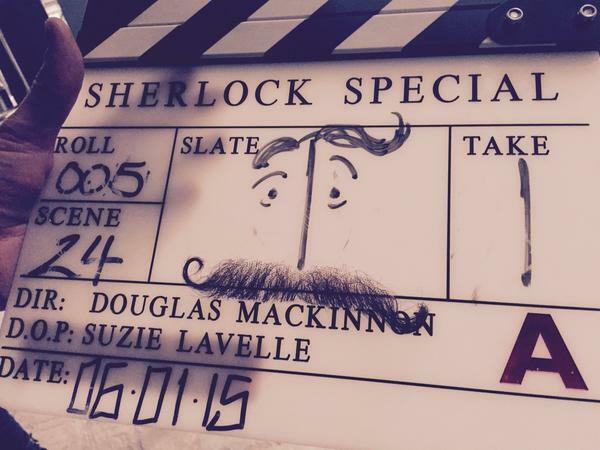 While no one directly involved with this episode will admit that it’s a Christmas special – Gatiss himself is very particular on this point – personally, I would hazard that there’s no way it isn’t a Christmas special, given that it seems unlikely the BBC wouldn’t hold the one singular episode of their most popular series that they’re going to get in 2015 until the very end of the year. But, that’s just me. Feel free to take that with a mountain of salt. At any rate, despite the fact that the Sherlock special will be completed quite early in the year – production on any given episode of this show tends to take about four weeks, not counting post-production editing and all of that – fans should probably prepare themselves to spend most of the year waiting to see it. So, there’s plenty of time to speculate, at least. What do you think this one-off installment of Sherlock will focus on? Hit me with your craziest theories!